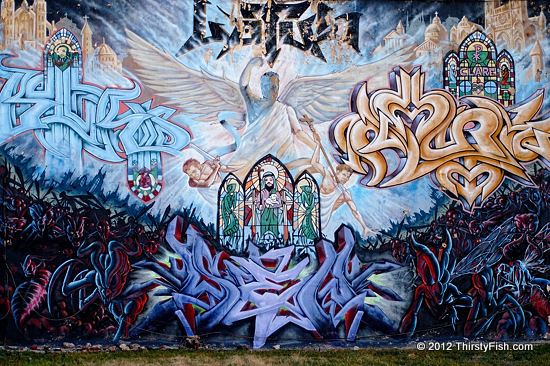 Philadelphia Mural (South St. and S. 13th) / "St. Michael the Archangel"
This mural is found on the side wall of Harry's Occult Shop. I can't quite make out the tags, but the subject of the mural is pretty clear. It depicts the biblical scene of St. Michael the Archangel leading God's armies against Satan's forces during the "War in Heaven". The ancient serpent is driven out of heaven, and cast down to the earth. The demon figures in the mural seem to be modeled after Beelzebub, the "Lord of the Flies". The Devil has many names (and faces): The words, Serpent, Dragon, Demon, Diablo, Fallen Angel, Lucifer, Beelzebub and Satan have been variably used to depict the personification of evil. The role of the Devil differs between beliefs and traditions, but most commonly, the Devil is recognized as an adversary that tempts humans to commit sins. After Archangel Michael's victory, Satan along with Fallen Angels were thrown to Earth. But Satan is not the only one expelled from heaven. He tempted Adam and Eve into eating the fruit from the Tree of Knowledge; and hence, The Fall of Man. We need Archangel Michael here on Earth... This place is getting out of hand.